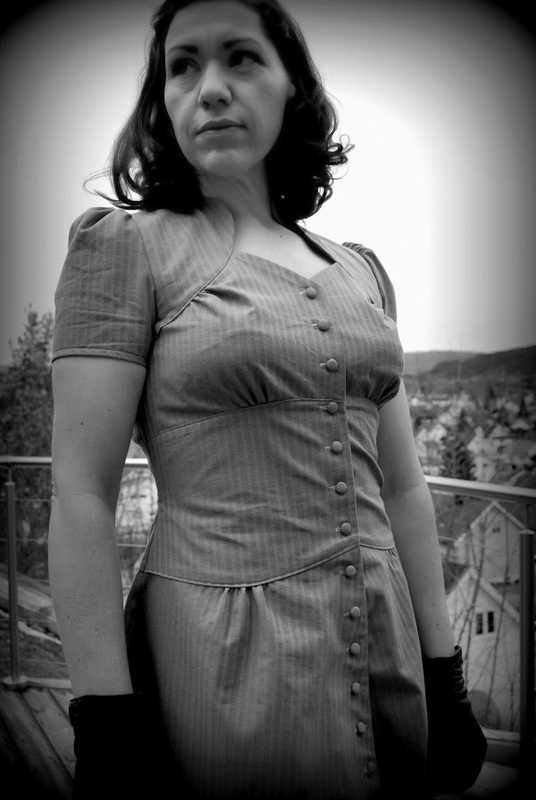 So here it is, the final version of the Colette Ceylon dress! 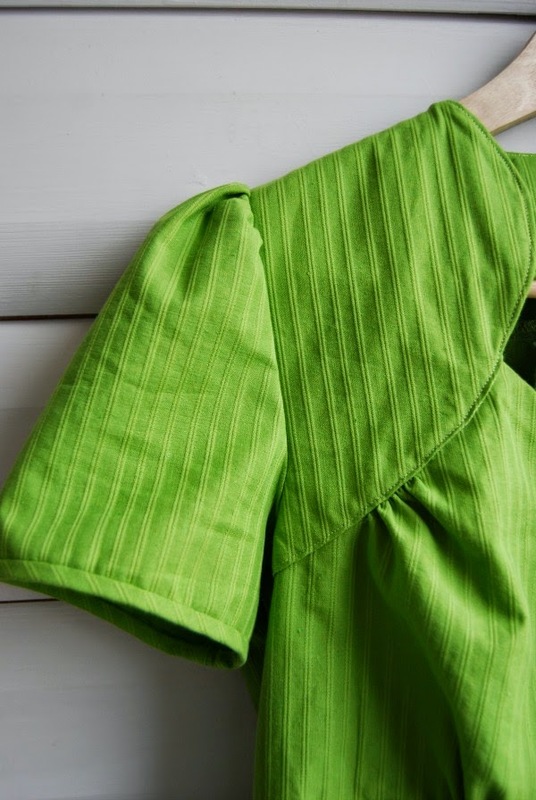 This is made with 100% organic cotton with a tree and leaf print, and a wee bit of contrasting baby corduroy (also all cotton). I opted for flat plastic buttons this time, as the self covered kit ones were just crappy. I also added a little to the length, as I wanted my knees covered (she said, sounding 98 years old). Yes, I am a lady after all!! Trustwothy buttons, with a vintage vibe. The main fabric is rather light weigth, and I don't think it drapes as nicely as the seersucker. I also still feel that the print is too large for my liking. I was also planning on having a belt for this one, in the contrast color. But as faith wanted it, a buckle was no where to be found, so that obviously didn't happen. I think it might look good, so I'll still be on the look-out for a suitable buckle. At some point in the process, I was debating whether I should also do the sleeves in the darker color. I decided against it this time around, but on future Ceylons, it may very well be a nice addition to the dress. So now, let's move on from this Ceylon business! Some progress, and a dash of doubt. So, there was some progress over the weekend with the Spring for Cotton Ceylon dress. I am nearly done, just buttonholes, hemming and finding the right buttons left. Sewing it up went swimmingly, and I might have broken the Pinhouse record for speediest construction of any garment. But then I went to try it on. And as it turns out; I hate it. Yes. I do. Or rather, hate is a strong word. I don't love it. I decided to make a contrasting yoke out of some corduroy left from the Fall for Cotton challenge, but I don't think it looks as good as I imagined. It's just... well, not very springy. I'll just get it finished, and photographed properly and call it a job done. 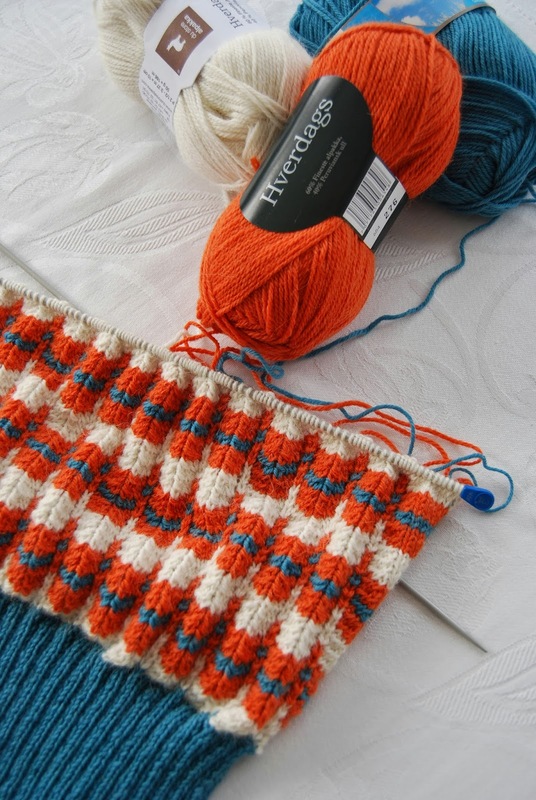 On a more positive (and springy) note, I started a new knit! 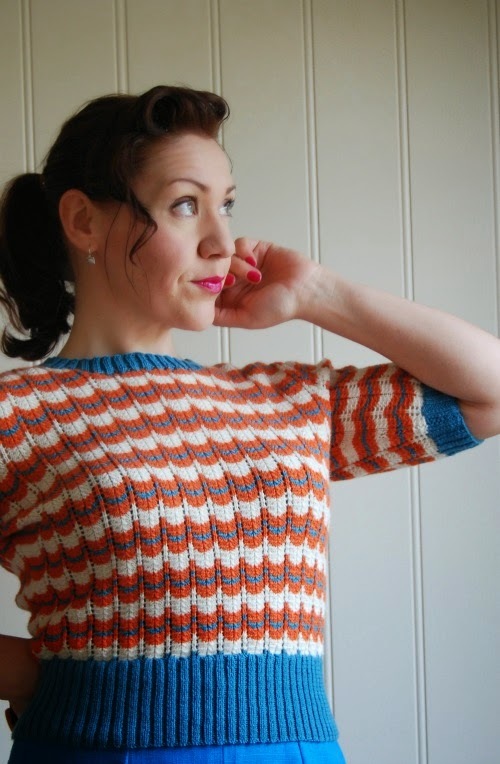 It is the Lavenda #915, or Rainbow jumper. I chose a slightly different palette than my recent makes, but all colors are on my chart of Me-colors, so stickin' with the rules (let's just say, more Simplicity#3688 pants are coming!). I trust you all are having a wonderful weekend! 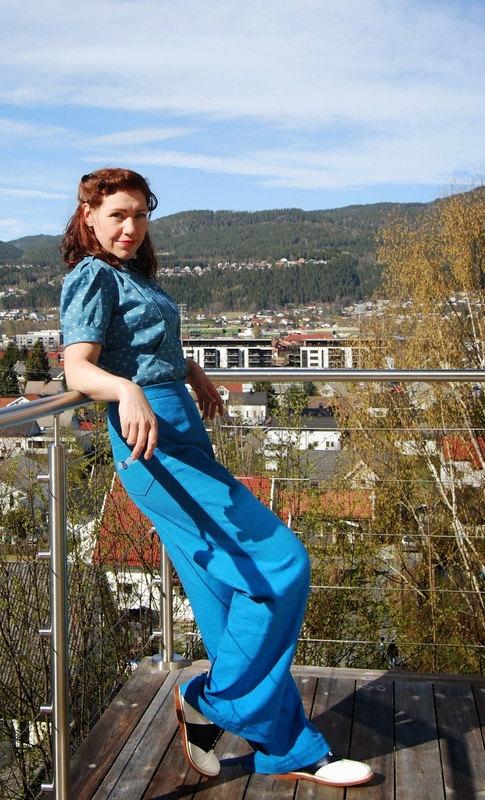 Sun is out in Norway-land, so I have finally snapped a few photos of my rather fabulous swing trousers I made two weeks ago! 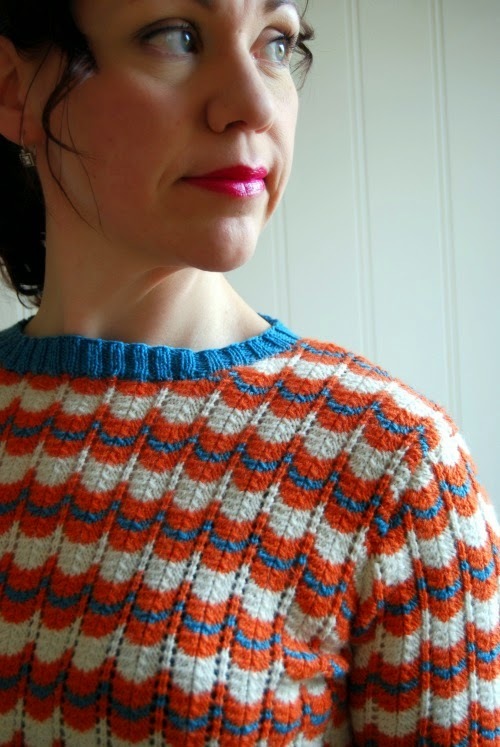 I have had this pattern for nearly two years now, and everytime it turned up on someones blog (looking smokin'), I always told myself to get on with them. Obviously, that repeated itself multiple times, until my Victory jumper was done and I didn't have anything to wear it with. 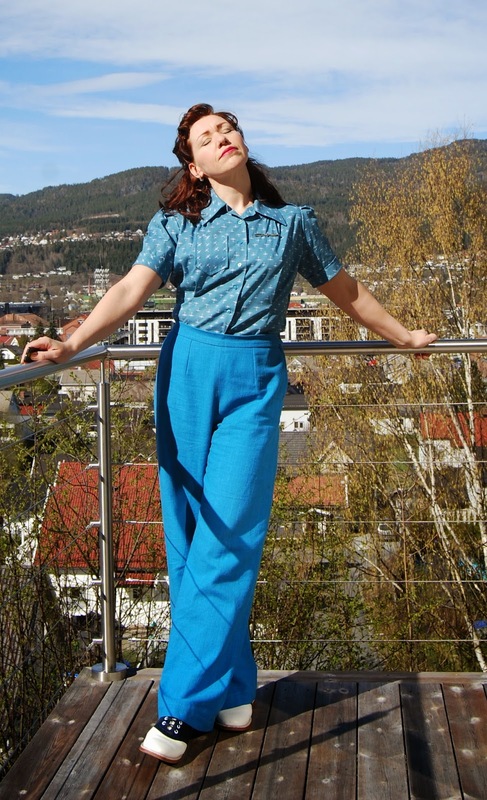 I have also been debating whether high waisted trousers look good or not, but I have decided to stop that. I almost don't care how they look, because they are the most comfortable pants ever! I made mine out of heavy linen, they are super soft and has a gorgeous drape. I think I am in love! Needless to say, I *will* make more! Construction wise, they are super easy to sew. I made them in an afternoon. Fitting them was easy, I just picked my size in the waist and a smaller size in my hips (yes, I'm backwards like that!) and blended the area inbetween when drafting the pieces onto my pattern paper. 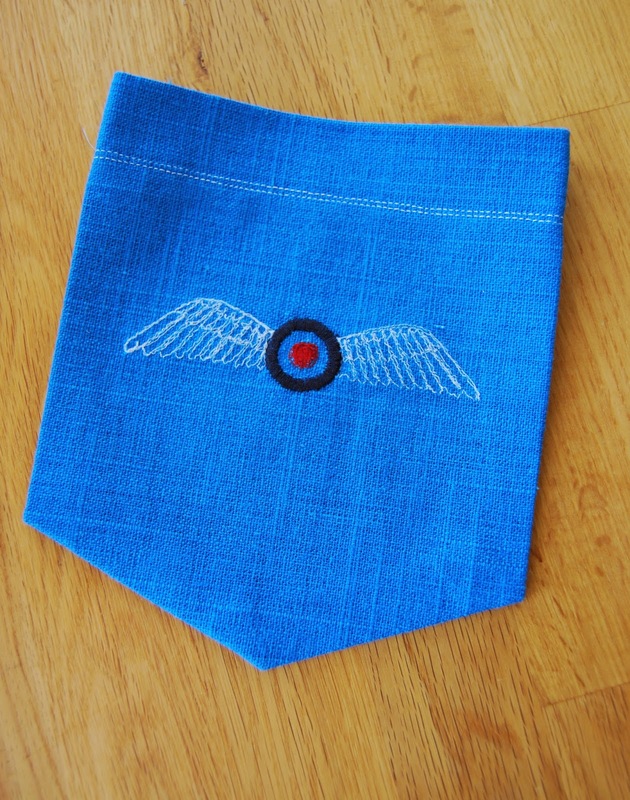 I ended up embroidering RAF wings on the pocket, just because. I initially planned on having wings on both pockets, but the embroidery is done on machine and my neck nearly fell off after this first one, soooo... One it is. So there it is, finally! My own version of the Simplicity #3688. Well, this post is just me getting my rant on about the #1 thing that annoy me the most. Bad quality items. The dissappointing item in question. In my quest for the perfect button for my first Ceylon, I decided that self covered buttons were the way to go. I found a kit at my local fabric store ages ago, and found them in my stash for this project. They were easy to make and looked really good, so I went back and got enough boxes to see me through the final version as well. 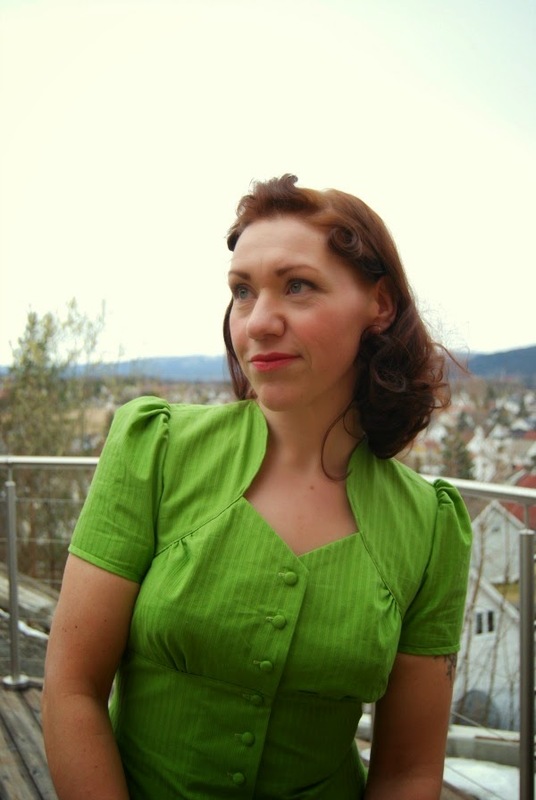 Last weekend I wore my green Ceylon for my hubbys 40th birthday party. As I was getting dressed, on of the buttons just dropped off, and left hanging on the dress was the button shank..... And I had ten guests coming in 15 minutes. The worst thing was, I had this happen when I first sewed the buttons to the dress. I wrote it off as the one rotten egg in the basket, but now I am not so sure. 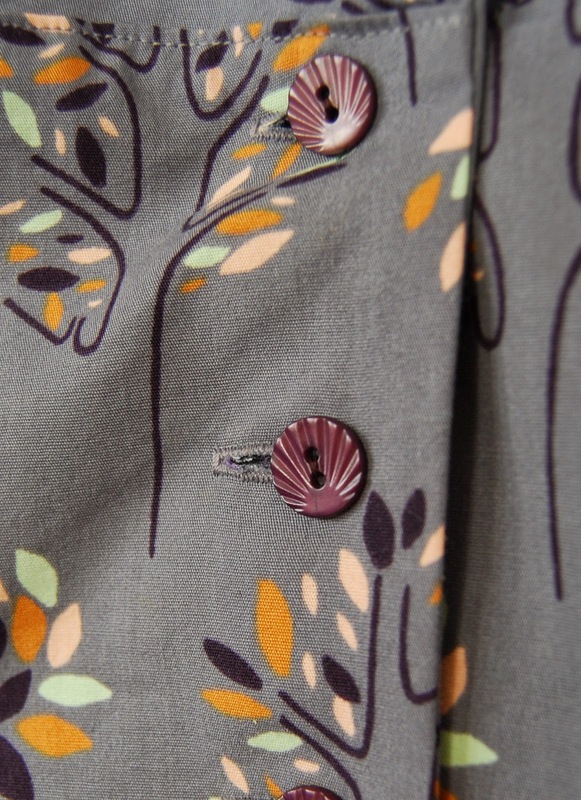 I managed to save the day by wearing a small vintage brooch, in place of the button. 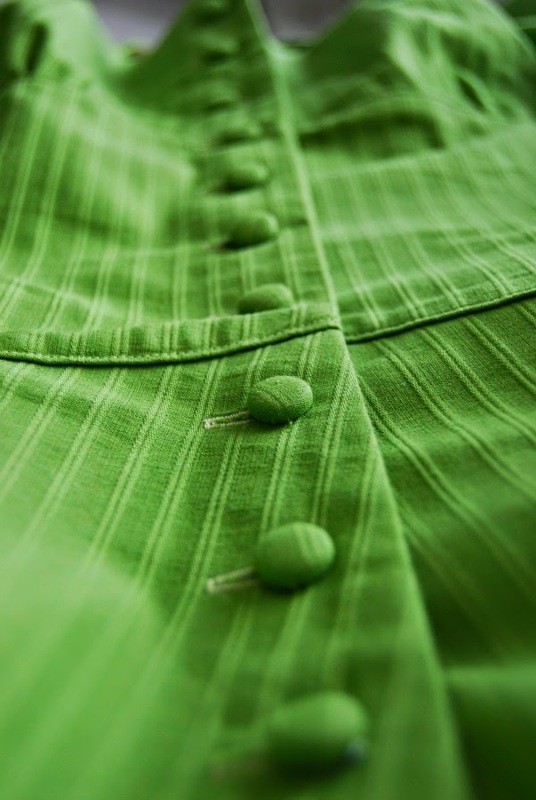 That was just pure luck, as the missing button was the one most centered on the bodice. It may seem like a small thing, but now because of the buttons, the dress can't be trusted. I was planning to wear it on our sportscar trip to Denmark in May, but if that means carrying extra buttons and sewing kit at all times, it is not happening. All the buttons will need to be replaced now, and a different option will have to be found for the final Ceylon. Ah-nnoyed! Have you ever had this happen to you? Do you now have brands you stay clear of? 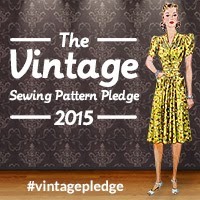 After having that major sewing spur over the Easter holidays, my sewing has slowed down drastically. I blame my job, I have been working graveyard hours this last week, starting at 0300 in the mornings and working extra hours after the regular 8, so I don't feel like squeezing any sewing in on top of all that. But that does not mean I don't think about it! I suddenly realized that the deadline for the Spring for Cotton sewalong is just a couple of weeks away, and I best get sewing that final Ceylon dress. I feel it will be fine, I have had two test runs already and don't think there will be any unforseen problems with that one. Lately, I have been thinking alot about suits. I think it was Lauriana, at Petit Main Sauvage, that awoke my interest initially with this image of a fabulous ensemble from the fifties. 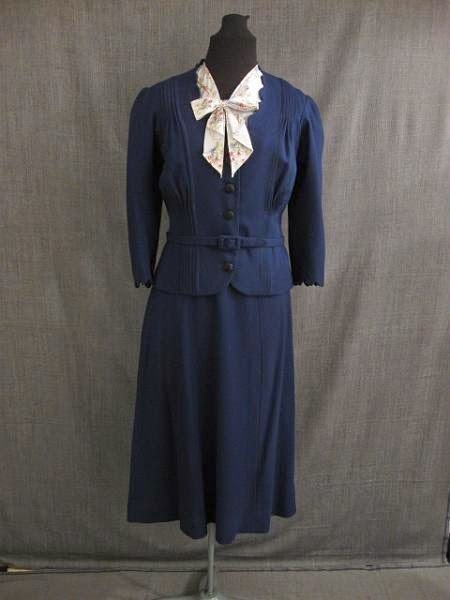 I was also watching Foyle's war over easter, and I always get 40s fashion urges after seeing it. So I went searching online for some more inspiration. And there's lots!! 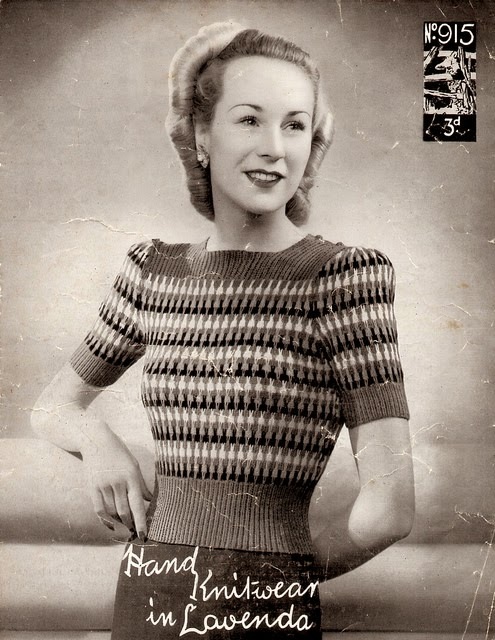 This first image is rather an iconic one and turns up "everywhere" 1940s fashion is discussed. 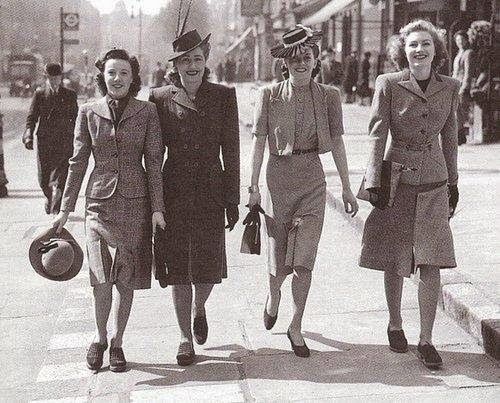 Four lovely stylish ladies walking down the street, turning heads no doubt. I especially like the jacket on the far right, with the belted waist, the sharp lapels and two tone collar. 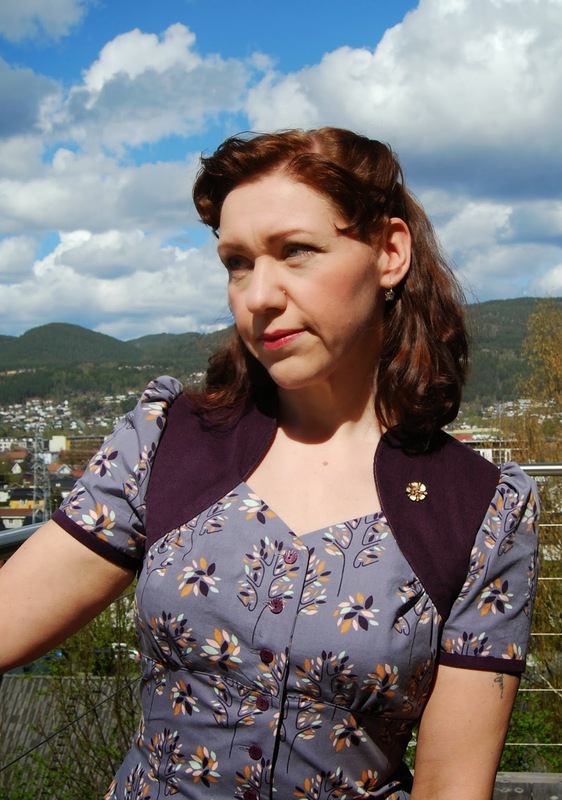 The short sleeved bolero jacket is lovely too, and the dress underneat has some beautiful underbust gathers and just a great slim silhouette. 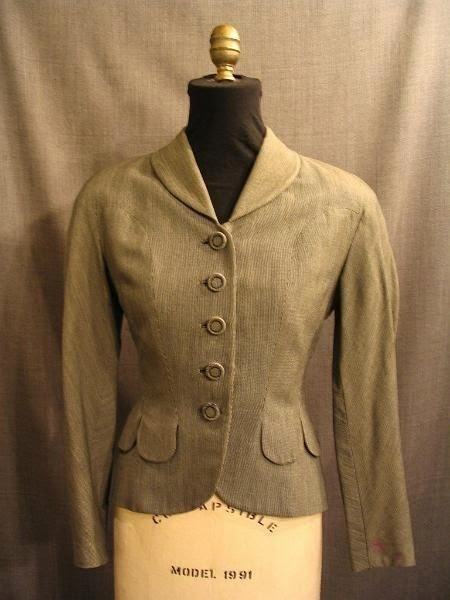 There seemed to be a great variety of lapel shapes and detailing like gathers, pintucks and different pocket flaps and buttoning. 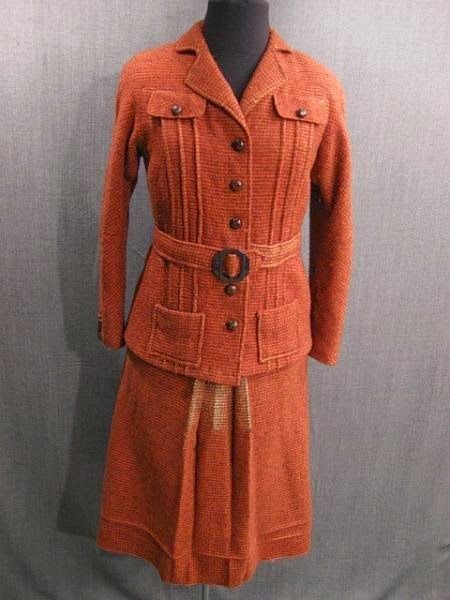 Some were heavier, more utilitarian pieces, while others were more dressy, made of lighter fabrics. More suitable for a night out dancing, than running errands. that put emphasis on the small waist. 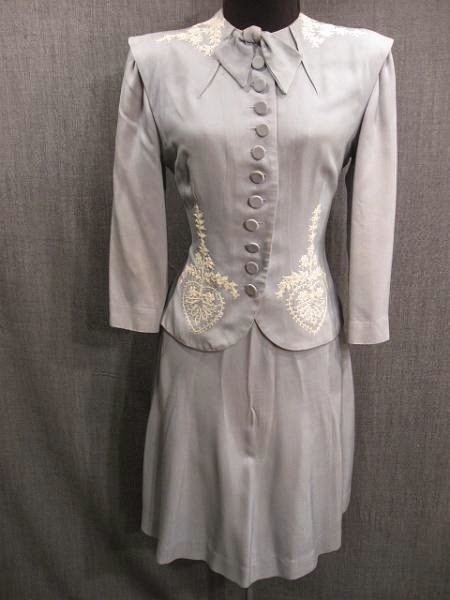 Plenty of buttons and a lovely neckline. I think this is my favorite lapel shape. 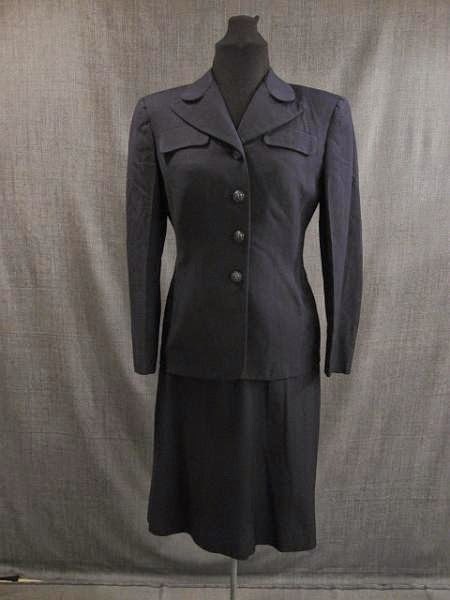 This suit has a distinct military flavor to it. Lots of interesting details, and a rather unusual color. and not actually closing at the front. Just a fabulous chic jacket. It looks to be very well made. Allthough it has padded shoulders, it is not the typical sharp 40s shape. The three following pieces are your more dressy ones. 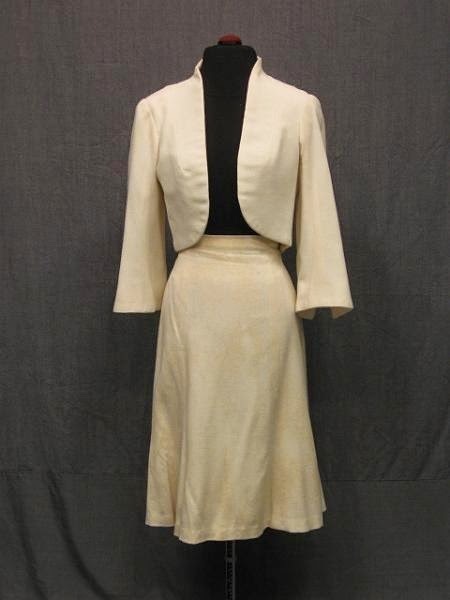 The cream bolero suit is gorgeous with its trumpet sleeves and clean lines. 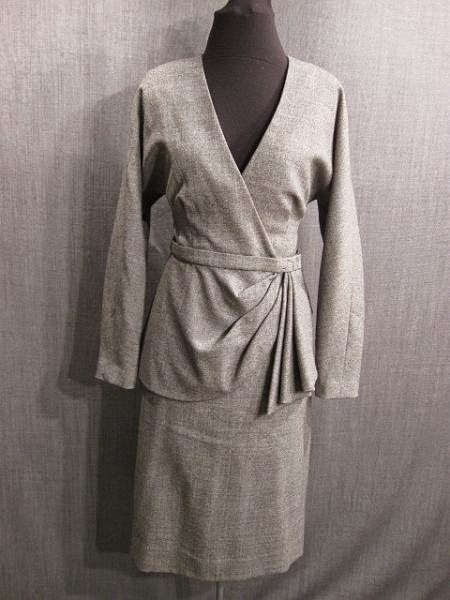 The grey one has a wonderful drape at the waist, and the light blue one has dramatic shoulders and an interesting darted neckline. The embroidery is stunning. 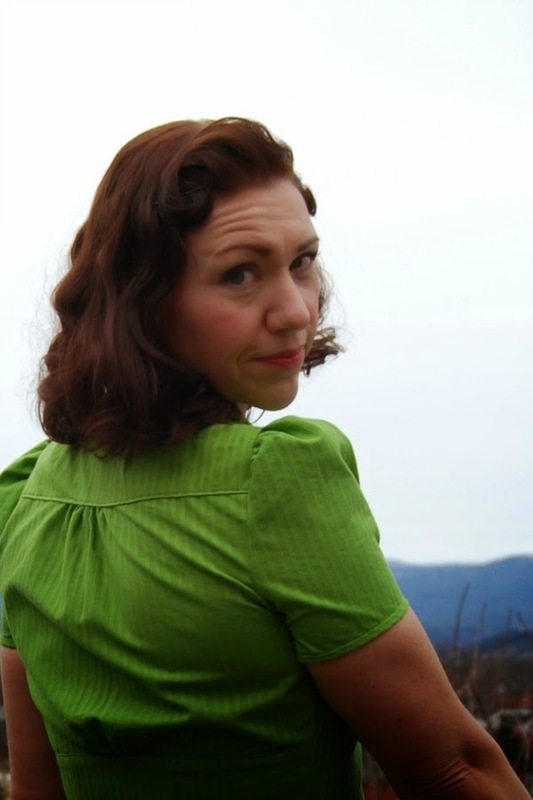 pintucked shoulders and waist that create fullness at the bust. I would really like to make a suit for myself. Or maybe two! There are so many lovely options. 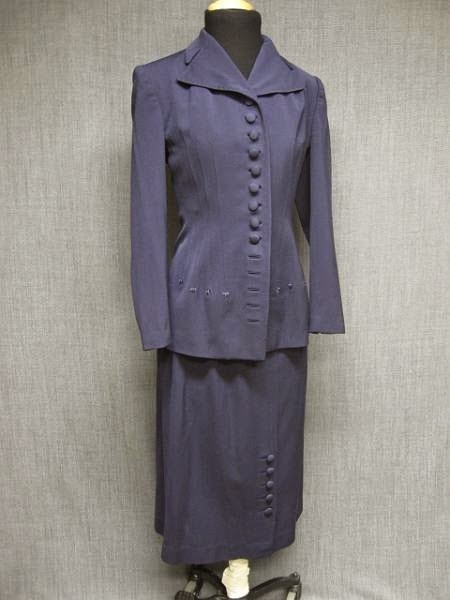 Womens two piece suits makes for a very put together look, and I think they have many uses. Dressed up or down with accessories, a plain suit is very versatile. I also feel I am that "grown up" now that I could use a suit or two! 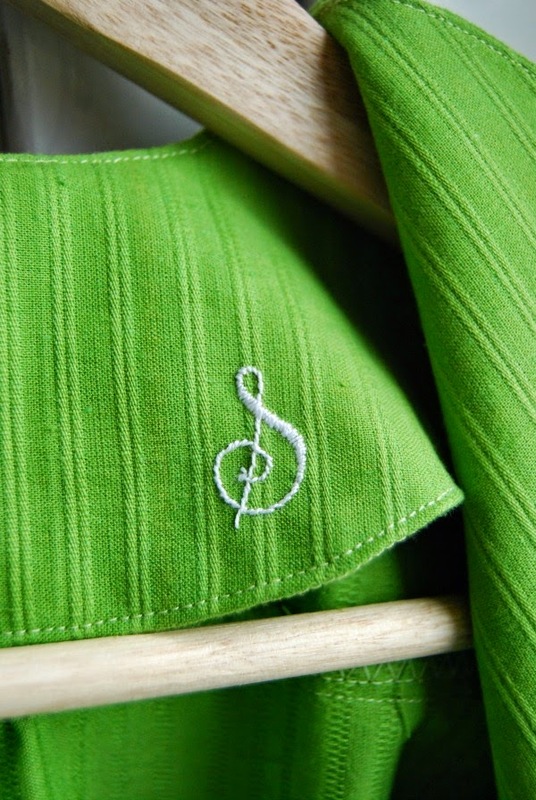 I couldn't find a picture, but I envision a short sleeved plaid version for summer in a linen blend perhaps? What about you? Could you see yourself in a suit? Or do you regularly rock one? So, everyday life is back on the menu again, after the blissful Easter break. Work was same old. Dusty, greasy and loud. As cable factories are, I suppose. But nevermind that! I can finally share my Victory jumper with you all. Behold! I finished this one two weeks ago now, but quickly realised I would need to sew a pair of pants to go with it, as it ended up shortish. At least with my RTW jeans, which for the most part are low to medium rise (hate those pants!). So let's focus on the jumper, shall we? I used an alpacca/peruvian wool blend yarn, super soft and not at all itchy. 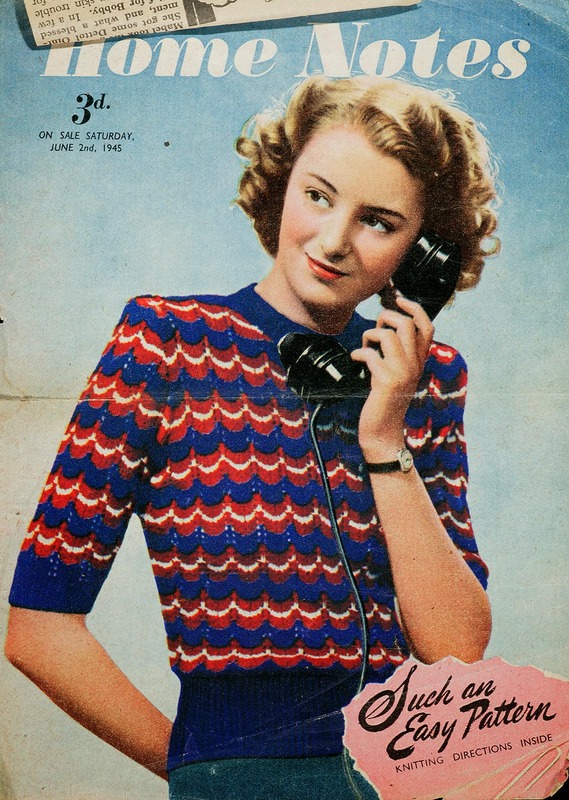 The pattern is of course the infamous Victory jumper from 1945, released in celebration of the end of WW2. It is written for a 34" bust, and a quick calculation showed it was easily graded up just by adding some more of the 9-stitch repeats. Easypeasy! 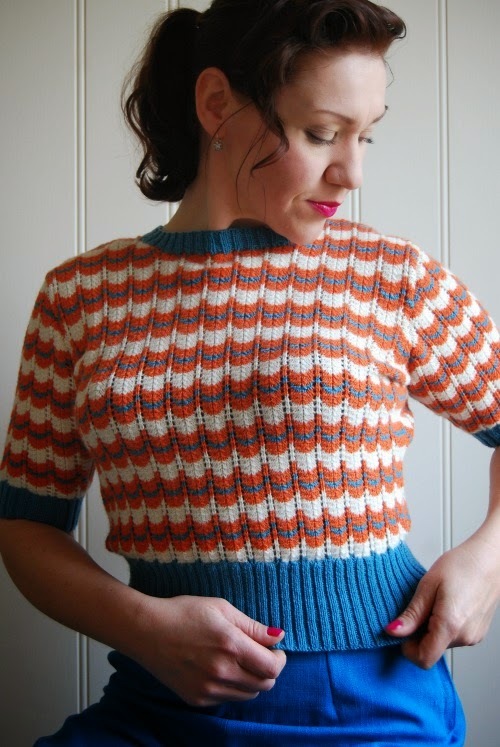 The lovely waves magically appeared as the knit grew, the feather and fan pattern with it's increases and decreases does that. So all I had to remember was to change the color now and then. Despite using no 3 needles (2.5 for the ribbing), it was quite quick to knit. It made up nicely, too. I did knit the neckband all in one after assembly, instead of separate for back and front as the pattern suggests, I think it is easier to get it nice-looking that way. I did mention that it is a tad short. 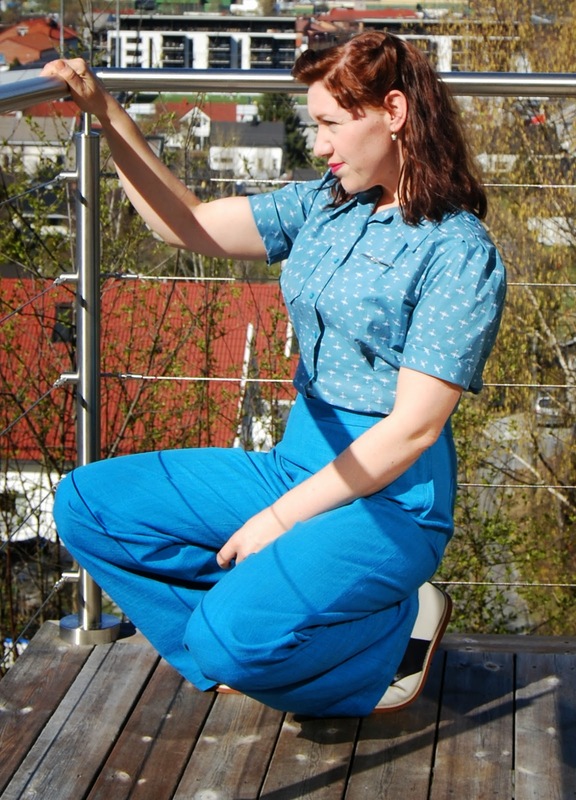 It looks fine in the photos, but I am dependant on some high waisted trousers, and I am still debating whether that is a good look for me. So a longer jumper would solve that conundrum, or maybe just wear it with a skirt. 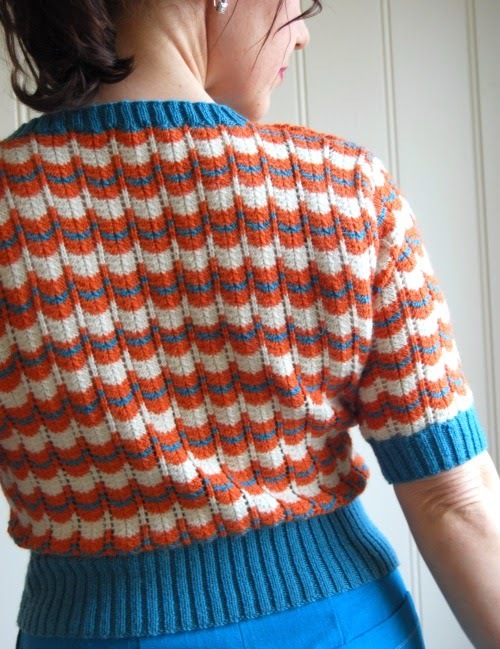 In any event, I love how the jumper turned out, and I would love another one! 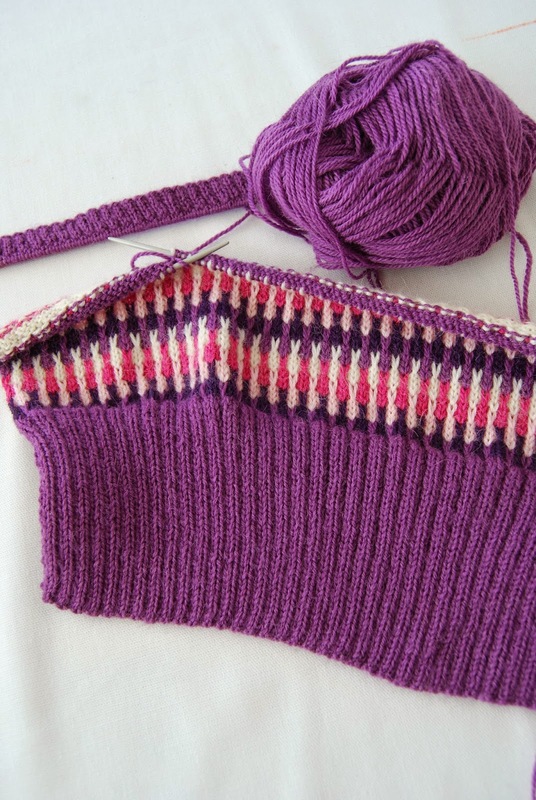 Knitting is kind of a winter activity for me, so we'll see if the needles get shelved! Hello people! I've had the best Easter break ever! 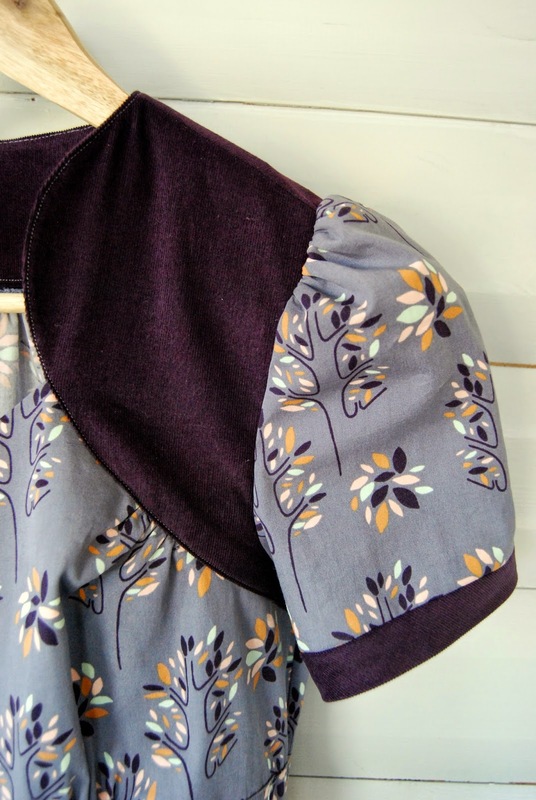 Ten uninterupted days of sewing bliss. No rushing, just pure enjoyment. Aaahhh....! 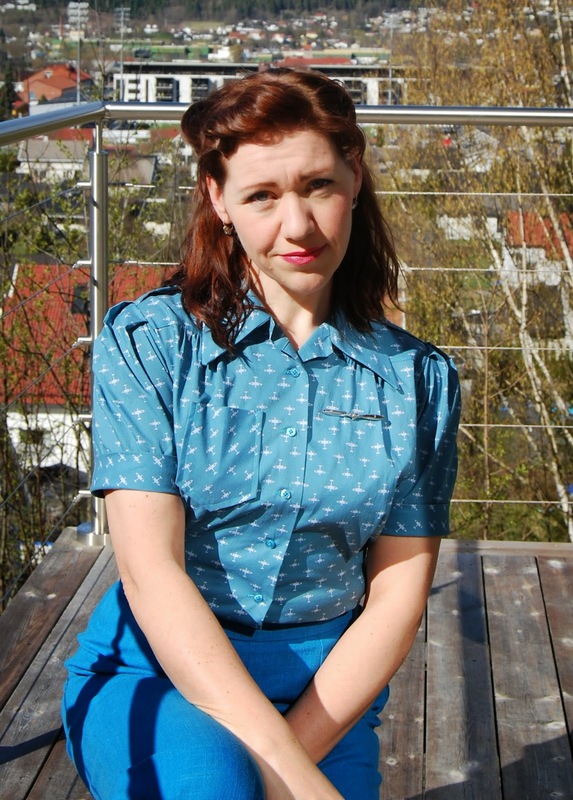 And here is the result; my second version of the Colette Ceylon! Early on I kind of loved it, and decided to treat it like a final version. I wanted to check out how it would behave with buttons, so I fitted it with all 16 self covered buttons. The insides were all finished with Berthas overlock stitch, and look super neat. The fabric is actually a good quality cotton seersucker duvet cover in a super pistachio green. I got it many years ago from my mothers auntie Mary, and I never took it out of it's packaging 'cause it was too short for my duvets. It feels nice to make use of it, especially since it turned out so great. I am sure auntie Mary would approve, God rest her soul. I made just a few alterations from the first version. The sleeves were widened just a bit, and I finished them with bias binding. I took some of the curve out of the midriff piece, cause let's face it; I am not that curvy. I also added one and a half inch to the overall width of the dress, to fix the riding up issue. I can see from some of the pictures that it still looks like it wants to migrate upwards in the back. I might try shorten the midriff a little on the final dress. I decided to do nothing to the armscye, and I think the fit is good as is. I really like all the small gather details on the bodice front and back, it makes a great shape and adds interest to a plain colored dress. I am still making another one in printed fabric for the Spring for Cotton sewalong, and I am excited to see it in some print. So did you have a great Easter? Did you make something fabulous?